This is a post I hate to write, but it is sadly necessary. A number of parents choose to opt out by having their kids refuse the assessment. This is completely fine. Choose the best route for you. A growing number of schools have chosen to work with parents to enable the refusal to take place in a secure environment, where the student is not bullied, and then the kid goes back to class. That is the proper and humane approach. And then there are the rest of them. For some schools, there is a sense of necessity to trick the child or the parent into taking the assessment. Kids are told they must sit in the room for four hours even if they refuse. During that time they may be subjected to pressure from the proctor to attempt the assessment. Even more boldly, multiple instances of trickery have been reported where the child is told that the school has just spoken with the parent and the parent wants the child to try the assessment. This is deceitful and a gross violation of parental rights. But it happens. And it happens every year. And no matter how many times we warn parents, they all claim shock and surprise. Please take steps to prevent you and your child from being tricked. We advocate using a password system. You and your child agree on a password. Once the child is at school, if they are told that you have agreed to let them take the STAAR, the teacher must give the password. If the teacher can’t tell the student the password, the student knows it is a trick and should continue to refuse. The student needs to be made aware that the teacher or principal may threaten punishments. 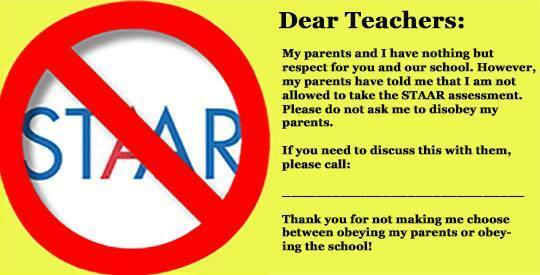 The student needs to know that these are likely just tricks and the parent will fight for the student no matter what. No password = no attempt. The password gives the child a sense of power and control that the school can’t take away! As soon as they get into the room, set it on the desk. If the teacher asks them to attempt the assessment, they should just hand them the card and tell them they need to talk to the parents. Between the password and the Dear Teacher card, you can take positive steps to prevent your child from being tricked or bullied into assessment. Easier to keep the child at home during all Starr days. Write excuses for all days and honest reason for absences. Parents have the final word, not schools. 1. That is an incredibly privileged statement. Not every parent can stay at home or provide childcare for the kid during the entire assessment window. 2. With the new two week online window, a difficult school could easily force a parent into truancy by your method. 3. Some parents prefer their kids to return to class with their peers. It’s not a matter of easy or not. If you have the resources to stay home with your kids for two weeks, great. For those who don’t, this post is intended to help them. I don’t know what you means about parents have the final word. I agree a parent can refuse assessment and the school can’t compel it. That doesn’t mean there aren’t potential consequences a parent needs to plan for and avoid.